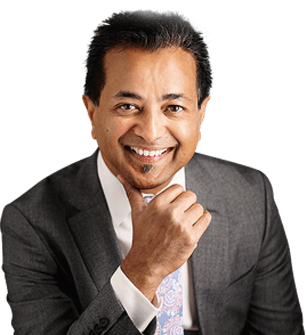 What is Radiofrequency ablation (VNUS closure)? This modern technique is a minimally invasive treatment option for varicose veins. 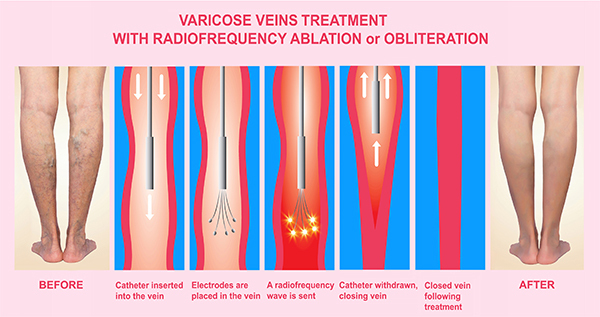 The varicose veins are treated by the principle of heat induced damage to the inner lining of the veins by using radiofrequency energy. A special narrow tube (catheter) is attached to a radiofrequency generator which is used to obliterate (close) the faulty vein using locally directed heat. The blood is then redirected through nearby healthy veins. The procedure is often performed under general anaesthetic. An ultrasound scan will be used to mark the veins that require treatment. A small flexible wire will be passed into the vein and a narrow tube (sheath) is passed over this wire and then the radiofrequency or laser probe is threaded through the tube. The position of the probe will be checked and further local anaesthetic will be injected around the vein. The generator then creates heat energy to seal the vein from the inside. This takes just a few minutes. Once the vein has been sealed the probe is removed. What is “Venaseal” glue treatment for varicose veins? Vein Glue is also known as “Venaseal”. This modern technique works along the same principles as radiofrequency ablation and laser therapy but uses a medical grade glue to block the faulty vein. This procedure can be performed under a local anaesthetic and allows early patient mobility and does not require the use of stockings.